I’ve hinted at breathing in a lot of my previous posts, but it definitely deserves its own feature. People may not think breathing is a big deal, but I can assure you it is. Most athletes are unaware of their breathing patterns, except for maybe after a floor routine when they’re gasping for air. Periods of fatigue shouldn’t be the only time they pay attention to it. Athletes and coaches should be aware of proper breathing through all of practice, and I feel working it should also be a regular part of training. There is much support in the idea that mastering breathing plays a huge role in core control, power output, the state of their nervous system, mobility, recovery, and battling fatigue. In the next two weeks I’m going to share some background to breathing, along with 5 reasons behind why I work it every practice with our gymnasts. Send Me the Cardio Guide! What’s Classifies “Good” or “Bad” Breathing? I use those terms very loosely because based on the person, scenario, their movement, and the present demand, an exact definition for “good” or “bad” is variable. Also, there are literally weekend courses build around these ideas so I’m going to keep it superficial on purpose. So who cares about good or bad breathing right? Even though it may be weird to bring up with your gymnasts, here are a few reasons to consider it. The diaphragm has more than one role. One role is assisting the exchange of gas like oxygen and carbon dioxide, which many people term “respiration”. It’s a good thing we have the diaphragm to help us with this on an automatic and reflexive level, because we wouldn’t make it too long without it. Along with respiration the diaphragm also serves as a major player in spine control, serving as one piece to the canister type structure surrounding the spine. It works conjunction with a ton of other structures like the obliques, pelvic floor, deep stabilizers, fascial connections, and more to create active stability during movement. The ability to use the diaphragm for breathing while simultaneously using it to assist in co-contracting the entire core unit (not just flexing that sweet 6 pack) is what helps make up a beast like core. Along with this, it has been suggested that proper breathing patterns helps foster reflexive activation of very important, smaller, deep stabilizers of the spine. These include the multifidus, transverse abdominis, pelvic floor, and tiny muscles that bridge only a few spine segments. There is much more complexity to it but the take away is that gymnasts should know how to maintain core tension while also breathing. If the brain is faced with the situation of “respirate and live” vs “keep the core working ideally”, respiration and living tend to win. I think many times this is where we see rib flares during shaping and coaches keep saying to hollow, but gymnasts can’t maintain both aspects to breathing and it’s an uphill battle. 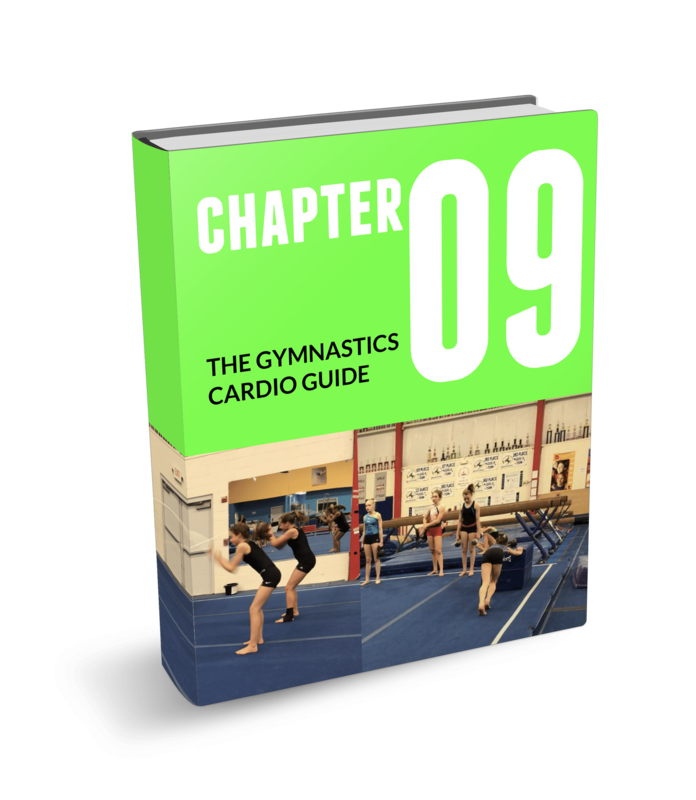 Gymnasts who constantly hold their breath to do simple drills or basic core conditioning movements might need this education. I feel that pairing proper breathing with 360 core training, reflexive stability drills, progressive loading, power exercises, fatigue training, and good technique you can really tap into incredible core power that keeps the spine safe. Here’s is a video I filmed a few months ago for a hip mobility article highlighting this idea. It shows these concepts, and also discusses a common compensation method where the gymnast overuses their lats/surrounding shoulder and hip flexor musculature to get their lower trunk/legs to move. This compensation tends to pull them into this chronic overarched/hip piking shape that finds its way into skills and many gymnasts struggle to correct it. I feel taking a step back to master this dual diaphragm function is a huge piece to the puzzle. As noted above the core area tends to act like a “canister” with the diaphragm on top, pelvic floor on bottom, and multiple muscular layers surrounding the spine and organs to act like a piston for force creation/transmission/absorption. Poor breathing patterns (like seen in videos above) can create lower back hyperextension causing the ideal “piston” alignment to be lost. Like seen in the video this then may come with compensatory movement changes in the hips, upper back, neck, or shoulders to help complete a skill. This over arched spine alignment can create an increased spine injury risk if loaded at high force. It is concerning because many gymnasts will be rely on passive stability like their spine joints and ligaments for support against this high force, rather than using the active muscular structures to absorb force. Many times a “hinge” point will be seen that is 1-2 spine segments getting over extended, and often looks like a kink. This is another big thing to look out for and address early due to the concern of overload to that area and risk of possible tissue damage/stress fracture development. In many gymnastics patients I have treated for back problems, this is usually the case and patient education/proper breathing is a basic I always start them with. Many people have likely seen problem to carry over into more complex skills as a gymnast who “jars” their back during tumbling or dismounts. They may get away with it once or twice if accidental, but that is definitely not a go to pattern I want them to use for skill work. I’m not saying we should be thinking about breathing the right way during bounding skills, but if we work it regularly the hope is that this becomes automatic during movement. 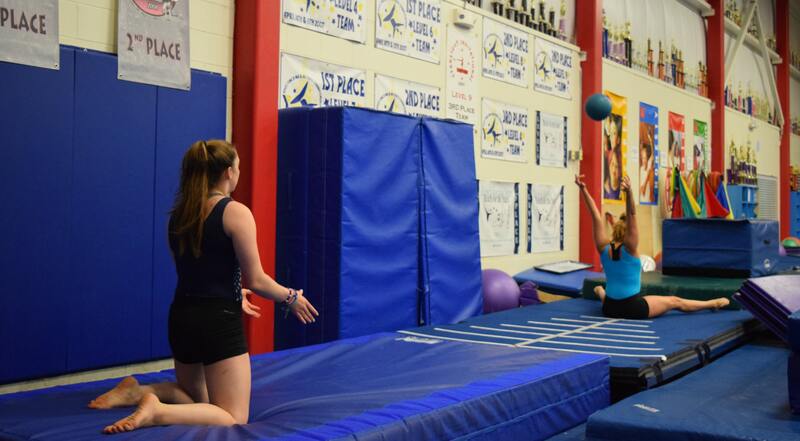 The same type of scenario can play into overuse injuries if the gymnast continuously relies on those passive structures to be stable during skill work. Even though we’re talking spine positions (and core control/strength is a huge part to this), remember that poor breathing can trigger this hyper extended spine and cascade these movement issues. The same concept of poor breathing with a hyper extended spine may also decreased power output during skills. Without good spine positions the gymnast may lose the “piston” effect through the core shown above, creating decreased core tension and inability to use shaping during skills. Some common manifestations of this are poor energy transfer in tumbling, poor power output in rapid hollow/arch shape changes for bar swings, and being force to “sink” into a broken shoulder angle during blocking skills. I feel many gymnasts should master the basics of ideal breathing with proper core control to create a solid spine foundation to use during training. Then from here it can serve as a platform for the hips, shoulders, and other parts to the body to express power off of during more complicated skills. Just going to leave it at that for this week so people can process it. I would suggest just start checking out the breathing patterns of gymnasts you work with, or try the breathing assessments on yourself to maybe become aware of the differences. Dr. Sands and I did once discuss the role of breathing with gymnastics as many gymnasts seem to hold their breath during skills. It’s hard to tell if it’s and automatic role of core control from the nervous system or possibly other factors like anxiety. But, I’m hoping that idea gets further explored down the road because it was really interesting to consider. Next week we’ll be back with Part 2 where I’ll talk about the links to mobility, how breathing influences calming the nervous system down, and some drills we use in our gym to work on breathing. Have a great week!